Massive flooding unleashed by deadly monster storm Harvey left Houston - the fourth-largest city in the United States - increasingly isolated Sunday as its airports and highways shut down and residents were rescued from their inundated homes by boat. The city's two main airports suspended all commercial flights and two hospitals were forced to evacuate patients. A local television station also was knocked off the air. At least three people have been killed so far, with reports of other fatalities still unconfirmed. As night fell, dramatic rescues - sometimes by volunteers with their own boats - were still taking place. The National Hurricane Center called the flooding "unprecedented" and said the storm, which crashed ashore late Friday as a huge Category 4 hurricane, would move into the Gulf before doubling back midweek, bringing even more rain. President Donald Trump, who had said he did not want to disrupt emergency efforts with a visit, is planning to head to the disaster zone on Tuesday, the White House announced. Rising waters from Harvey inundated roads throughout the Houston area, affecting every major freeway and hamstringing efforts to move people to safety. "It's crazy to see the roads you're driving on every day just completely under water," Houston resident John Travis told AFP. Another city resident, Brit Dreger, said: "It doesn't look like we're going anywhere for a while." Overwhelmed emergency services warned residents to head for high ground or climb onto rooftops - not into attics - so they could be seen by rescue helicopters. More than 2,000 rescues had been made so far. The local ABC affiliate showed the helicopter rescue of a man and his six-year-son - both named Jeremiah - from the second floor of their home. Each only had the clothes on their back and a backpack. "This is all we got," the father said. "We thank God. We thank God." Emergency 911 operators in Houston received 56,000 calls in a 15-hour span - seven times more than in a usual full day. "We are going on fumes & our hearts ache for community we serve, but we will not stop!" said Houston police chief Art Acevedo. Texas Governor Greg Abbott warned the operation was far from over, given the foreboding forecasts. "The number of evacuees is increasing. The number in harm's way will increase also with the rain that is forecast to come," Abbott said, adding that the storm had already inflicted billions of dollars in damage. Houston Mayor Sylvester Turner dismissed the idea that evacuations should have been ordered sooner. "You issue an evacuation order and put everybody on the highway - you really are asking for a major calamity," Turner told reporters. Houston proper has a population of 2.3 million people, but the greater metropolitan area has more than six million. Trump, who spent the weekend at Camp David, the presidential retreat in Maryland, had said he would visit the Lone Star State as soon as he could "without causing disruption." "The focus must be on life and safety," he said in a series of tweets about the disaster, his first major domestic challenge since taking office in January. Later, White House spokeswoman Sarah Sanders said the visit would take place Tuesday. At least three deaths have been blamed on Harvey, which has spawned tornadoes and lashed east and central Texas with torrential rains. 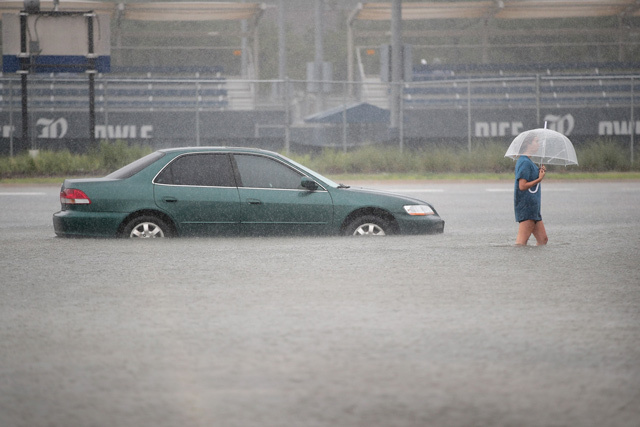 In Houston, a woman drowned when she left a car which had stalled in high water, and another man was found dead in a flooded Wal-Mart parking lot in the Galveston area, officials said. On Saturday local officials said that one person was killed when a house caught fire in the Rockport area, one of the places hardest hit. "The breadth and intensity of this rainfall are beyond anything experienced before," the National Weather Service said on Twitter. Houston opened community centers to shelter people forced out of their homes, but the mayor appealed to residents to stay put and not call the 911 emergency line unless they faced a life-threatening situation. "Even if there's a lull today, don't assume the storm is over," Turner said. 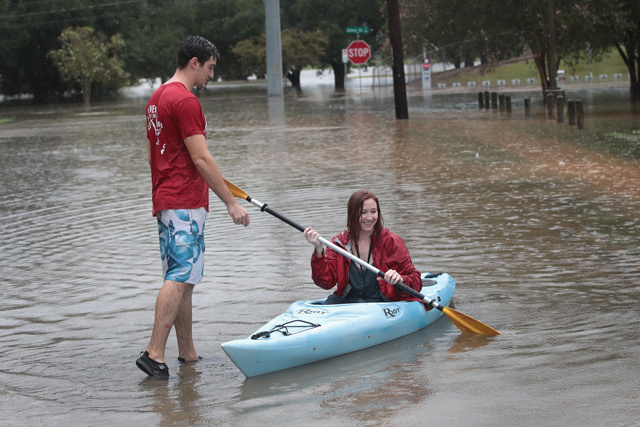 The National Weather Service said more than two feet (60 centimeters) of rain fell in Houston and nearby Galveston in a 24-hour period. Another 20 inches were expected. Flooding was expected to worsen as Harvey, the most powerful storm to hit the United States mainland since 2005, lingers over the area. Harvey ripped off roofs, flipped mobile homes and left hundreds of thousands of people in the dark on the Gulf Coast, home to some of the country's most important oil refineries. 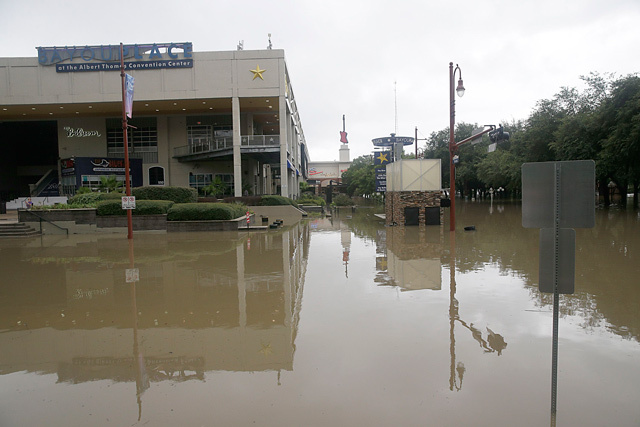 Houston's George Bush Intercontinental Airport and Hobby International, the city's two airports, also stopped all commercial flights. Thousands of National Guard troops joined local police and emergency workers to help with rescues in inundated areas of the city. Boats also were being deployed, but more were needed -- Harris County Judge Ed Emmett appealed to residents to use their own vessels. One volunteer rescuer told KTRK TV: "Basically, there were a lot of people out here and not enough boats." The Federal Emergency Management Agency (FEMA) said there should be no illusions about the long-term impact. "This disaster will be a landmark event," FEMA director Brock Long told CNN, adding it would take "years" to recover. Coastal Texas is home to a large number of oil refineries and a number of major ports. ExxonMobil said Sunday it had closed its massive Baytown refining complex - the second-largest in the country. US authorities said about 22 percent of crude production in the Gulf of Mexico, accounting for more than 375,000 barrels a day, was shut down. But Abbott said the oil industry was well prepared. "They have the ability to ratchet up back up there quickly," he said on Fox News Sunday, predicting a "one- or two-week downturn."